This blog post examines the different components of the marketing technology (martech) ecosystem. We will illustrate what the categories of innovation are and which categories have the most companies. We will also compare the categories in terms of their funding and maturity. Let's start off by looking at the Sector Map. We have classified 1,833 martech startups into 15 categories. They have raised $44B from 2,417 investors. The Sector Map highlights the number of companies in each category. It also shows a random sampling of companies in each category. We see that Marketing Automation Software is the largest category with 287 companies. These companies enable marketers to automate or enhance the process of inbound and outbound marketing. Some example companies are Sailthru, Infusionsoft, Tinyclues, and Salesfusion. Let's now look at our Innovation Quadrant to find out the funding and maturity of these categories in relation to one another. Our Innovation Quadrant divides the martech categories into four different quadrants. 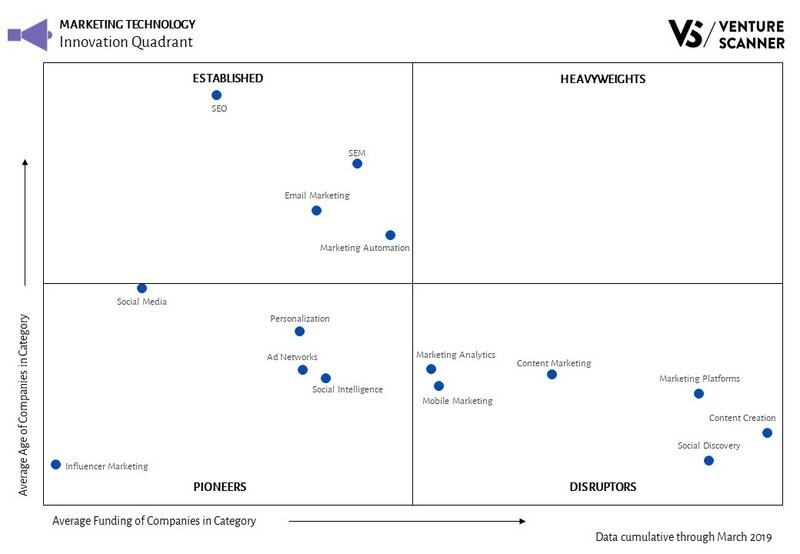 We see that the Disruptors quadrant has the most number of martech categories at 6. The SEO category has the highest average age, and the Content Creation category has the highest average funding. The Influencer Marketing category is low on both average funding and age. To learn more about our complete marketing technology dynamic report, visit us at www.venturescanner.com or contact us at [email protected].